If you want to clean up your diet and lose weight quickly, cutting down on carbs may help. But after you’ve had dinner in the evening, we all still feel that craving for something sweet. Especially if you’ve been dieting heavily! If you want a dessert that tastes great, but keeps your figure slim, we have plenty of ideas for low carb desserts that satisfy your sweet tooth while keeping your carb count low. Why Should I Eat Low Carb Desserts? Carbohydrates are often seen as the enemy of a healthy diet and of those who are trying to lose weight. That is because many carbs that we consume regularly are simple carbs, such as white bread, white rice, and sugary processed foods. Simple carbs are mostly “empty calories”; that is, they do not offer many nutritional benefits. Eating fewer of these carbohydrates can thus help you feel more energetic and lose weight. 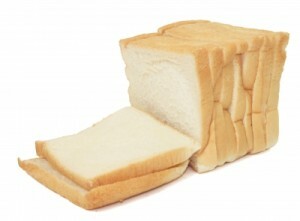 Avoid simple carbs like white bread and white rice if you’re trying to lose weight! Carbs are not all bad; we just have to choose the right kind to ensure that we have a healthy diet. Simple carbohydrates are not particularly healthy as they provide quick energy that disappears just as quickly, leading to blood sugar spikes and crashes. But complex carbohydrates, such as whole grains, provide enough fiber to keep you full longer and prevent blood sugar spikes. 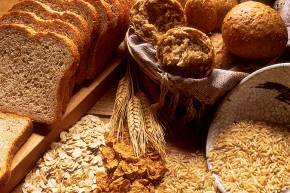 Nutrition professionals say that 60-65% of your daily calories should come from carbohydrates. But a lot of people stuff themselves with carbs during dessert! A piece of pie has a very high density of carbohydrates, and you should consider low carb desserts instead. 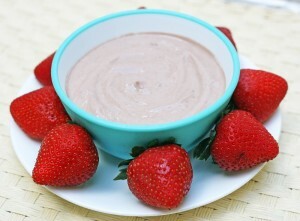 One of the easiest and quickiest low carb desserts to make! Spoon some yogurt into a dish and top it with a few chunks of your favorite, low carb fruits for a lightly sweet and satisfying treat. Panna cotta is a high-protein, low carb dessert that comes together quickly and always impresses guests. Boil two cups heavy cream with ½ cup water, 1/3 cup Splenda (or other artificial sweetener), and one envelope gelatin. Heat the mixture, stirring, for 6-10 minutes or until it starts to thicken. Divide the mixture among small cups, cover, and chill for at least three hours. 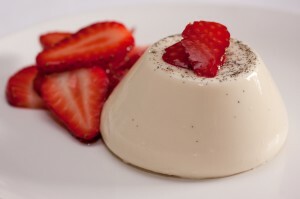 Panna Cotta is perfect for a cool, refreshing after-dinner snack! Chocolate lovers can enjoy low carb desserts, too! If chocolate is your thing, you can make a low carb, three-minute chocolate cake. In a large glass measuring cup, mix together ¼ cup almond flour, one tablespoon cocoa, ¼ teaspoon baking powder, three tablespoons Splenda, two tablespoons melted butter, one tablespoon water, and one egg. Cover the measuring cup with plastic wrap, cut a small slit in it, and microwave on high for one to two minutes or until the cake looks set but still moist. If you enjoyed this, try out our other low carb cake options or our advice on low carb brownies! Ice cream is a classic dessert option. Thankfully, many ice cream makers are aware that consumers these days are more health-conscious. As such, they’ve started to market a lot of low carb ice cream options. Score! 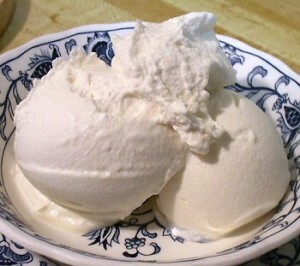 Even ice cream can be included in your list of low carb desserts! 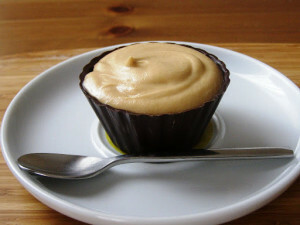 Peanut butter is a great low carb dessert ingredient. It offers protein and fat to keep you full and feeling satisfied. Try making a quick peanut butter mousse for dessert: Beat ½ cup heavy cream with 1.5 teaspoons sugar free instant vanilla pudding mix until stiff peaks form. In a second bowl, microwave four ounces cream cheese with ¼ cup peanut butter for 20 seconds. Add ½ teaspoon vanilla and ½ cup Splenda to the peanut butter mixture and beat until fluffy. Gently fold in the whipped cream in batches until well-combined. Get that Reese’s Pieces taste by putting peanut butter mousse in a dark chocolate cup! Eating dessert while on a low-carb diet can seem unproductive. I mean, most desserts contain sugar which will cause weight gain if consumed in excess. Luckily, today there are many artificial sweeteners out there that mimic the taste of sugar but contain few to no calories. The above low carb desserts are just a few options for those on a low-carb diet. Try one today – you will hardly notice the difference! While eating low carb desserts after dinner helps, many of us want to try to cut out the carbs from our every day life, too. First and foremost, you should have a low carb grocery list handy before you hit the groceries. Often times, our refrigerators are packed with unhealthy foods. If you want to make a change in your lifestyle, it may make sense to start fresh and clear out anything that may be unhealthy. This includes your junk food! It’s not unhealthy to snack. But it is unhealthy to eat junk! Consider picking up some low carb chips or low carb crackers if you’re dying or something to munch on. As for your meals, you have plenty of options to eat right. Stick to buying healthy ingredients from the low carb grocery list, and you’ll have tasty, healthy meals all the time! But if you’re a busy person and live on the go, it can be tough to eat healthy. You should also consider buying some low carb frozen meals. These are great for quick and easy meals for lunch and dinner! Remember, keeping slim does not mean starving yourself! Whether, you’re eating low carb desserts or low carb dinners, it’s also about choice. As long as you choose the right foods to eat, you can enjoy your meals, and enjoy a healthy lifestyle, too! Copyright 2015 Easy Low Carb Desserts. All Rights Reserved.